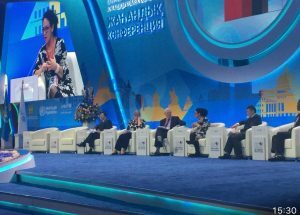 Maria Alicia Valenzuela, a Central Arizona College student enrolled in the Community Health Worker Certificate Program recently returned from the Global Conference on Primary Health Care held in Astana, Kazakhstan. The Government of Kazakhstan, World Health Organization (WHO), and UNICEF were cohosts of the conference. The Conference drew medical professionals who represented mostly at risk populations from across the world including World Health Ministers, as well as public and primary health care representatives. The invite to attend and present at this conference happened after Valenzuela did a presentation during a 2017 congressional hearing in Washington D.C.
For 18 years, Valenzuela has worked for the nonprofit Esperança. She currently serves as the Director of Domestic Programs and previously held the position of Community Health Coordinator. It is Valenzuela’s goal to complete her Community Health Worker Certificate in August of 2019 and continue with her current employer, expanding programming to support families in her community.